This article is part of our special report Cities and regions against climate change. An estimated 40% of all the agricultural land in the world today is used to grow feed grains for beef production, a trend that is set to worsen with the rise of the middle class in Asia, warns Jeremy Rifkin. To address food security, the human race urgently needs to “get off beef production and animal husbandry”, he told EURACTIV in an interview, saying this is “the big hole that nobody wants to talk about”. 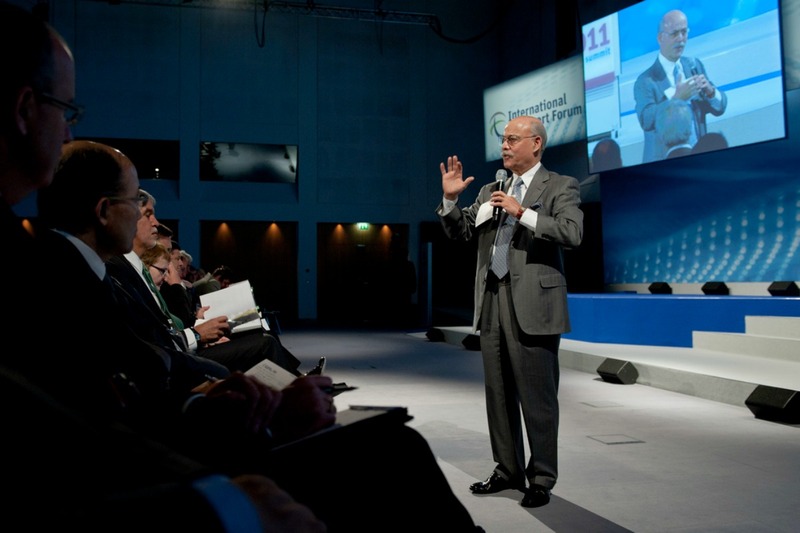 Jeremy Rifkin is an American economist and author whose best-selling Third Industrial Revolution arguably provided the blueprint for Germany’s transition to a low-carbon economy, and China’s strategic acceptance of climate policy. He spoke to EURACTIV’s publisher and editor, Frédéric Simon, during a recent visit to Brussels (before the Paris terrorist attacks). The interview focuses on climate change ahead of the COP 21 in Paris and is divided in two parts, the first on cities and regions, the second on agriculture. With the global population set to reach nine billion by 2050, politicians tell us that less land will be available globally for agriculture, which means producing more with less. Is intensive farming the only answer? Politicians say this because they’re missing why we have less land. A lot of it has to do with development, but here’s the big thing that nobody wants to address: we have a rising population mainly because we don’t have electricity in the developing world. That’s why [UN Secretary General] Ban Ki-moon has made universal electricity his legacy. If you take a look at the poorest areas of the world, they have no electricity and massive families. And very patriarchal: the women are the slaves, you get as many children as you can because some die and the rest are there to get the water, get the wood ? they’re the slaves. Even the abolitionist movement in the US took off with electricity. Because women could then be free to go to school, get an education. And the new skills in an electricity age did not require upper body strength. It’s the same in the developing world: bring electricity into a village, and the women will create the cooperatives, get an education, and have less children as they become more autonomous. We know this. You can distribute condoms until the end of history, (but) it won’t make a difference. What’s the connection with farming? The connection with farming is this: today, around 40% of all the agricultural land in the world is used to grow feed grains for animals. Nobody talks about it. So you jump to the neoliberal conclusion: We have less land, we have more people, let’s have indoor farming. I wrote a book called Beyond Beef: The rise and Fall of Cattle Culture. Cows for example ? beef production and animal husbandry in agriculture — is the number two cause for global warming emissions. Even Al Gore won’t talk about it! Number one is building and number three is transport, which can both be addressed by the Third Industrial Revolution I was talking about [see part one of this interview]. But number two is the big hole that nobody wants to talk about — we don’t want to fan people’s dietary habits. So right now, we have upwards of 40% of land used to grow feed grain so that wealthy consumers can live high up in the food chain. It’s the most inefficient of all our systems, much more inefficient than transport. It takes ten pounds of feed to make one pound of beef. The FAO issued a report saying that, at the speed at which we’re going with the middle class, we’re going to have two thirds of the land growing feed grain for the very wealthy. This means only one third of the land is left for the rest of the human race, which pushes prices up making it unaffordable to live. The first thing to do is free up the land and move from feed grain to food grain, get off beef production and animal husbandry. This would lower our ecological footprint, which means less land is used to grow the nutrients we need for survival. Imagine freeing up 40% of all the land tomorrow morning and we move to a new diet that addresses climate change. So, intensive agriculture cannot be the solution to global warming? The big problem is methane and nitrous oxide (N2O). Because methane is 28 times more potent than CO2, and nitrous oxide is 298 times more potent. The problem is that it requires a huge amount of fertiliser to grow that feed grain. And those fertilisers create CO2 when you use fossil fuels to produce them — that’s a huge CO2 eruption. Then when you lay them out, that creates huge amounts of nitrous oxide. And when the cows are on them, they’re belching massive methane as well. All of that is dysfunctional and inefficient. So we have to have land reform from feed grain to food grain. Then move out of petrochemical agriculture, fertilisers and pesticides. We have to move to organic ecological farming techniques — we have the science and technology to do it. And this reduces dramatically the cost and reduces the spread of NO2 and CO2 from fertilisers and pesticides. Then, every farm area should be part of a third industrial revolution infrastructure. Do you know what the biggest cost of farming is? I would say fossil fuels. So farmers are now creating electricity cooperatives ? not just here but across the developing world — so they can create their own wind. Just like here: if you travel from Brussels to Luxembourg, you’ll see ?all the farms have wind. They’re not only generating for themselves, they’re sending it back to the grid. So you have to move to the new energies, which are clean and near-zero marginal cost. Then you can start cleaning up agriculture and make it highly productive at low cost. What I’m outlining here is that these things are not easy. But they actually can be done to dramatically decrease our ecological footprint in agriculture. Essentially, you’re saying we don’t need intensive agriculture. What about GMOs? You know where the opposition to GMOs started? In my office. We started the whole opposition worldwide. We went out against Monsanto, the patents in the 1980s. We spent 30 years. Now, I understand you’re talking about intensive indoor farming. I don’t have a problem with that, because there will be some places in the world where the climate is going to move so quickly because of the water cycle change, that we will have to introduce some forms of vertical indoor farming, which can use less nutrients more efficiently. But that’s not the only answer. We also have to change agriculture. And we don’t need GMOs, we can do marker-assisted selection. I’m not opposed to using genomic knowledge, but GMOs don’t work. When you take one gene from an unrelated species, (and) plug it into another, and you don’t bring in the entire complex of the plant, it’s a bullet that doesn’t work in the long run. But marker-assisted selection is where life science companies are heading now. You learn the genomic information of say all your wheat strains. Then you can take some rare wheat strains that may be drought resistant for example and know what the genetic makeup is. Then you can take those to your commercial strains, and you can upgrade classical breeding much more cheaply. And you’re not crossing species lines. You’re creating more robust, vibrant crops. These are part of so-called new plant breeding techniques. Yes, it’s been around for fifteen years. This is what they’re doing at Syngenta and other places except they’re not saying it. But they’ve so invested in GMOs that they don’t want to say that it’s already arcane. I spoke with Monsanto and these companies fifteen years ago. I told them, you need to move to marker-assisted selection, and no patents on the seeds and you’re in. But they wouldn’t do it because they had invested so much in GMO. But all the new research is in marker-assisted selection. This is a long struggle. The European Commission is due to issue a decision in December on whether to qualify new plant breeding techniques as GMOs or not. What is your view? GMO is when you take a gene from an unrelated species, and you put it in the genetic code of another species. Marker-assisted selection. I have no problems with it, because you’re simply upgrading classical breeding with genomics knowledge. But I do have a problem with patenting it. If you look back, my lawyers brought the first case against GMOs. We stopped the first GMO, Ice-minus, from being released into the environment with a federal court decision in the US, which started this whole debate. Then we opposed patents on life at the Supreme Court. We’ve spent 20-30 years on this thing. So I’m not opposed to marker-assisted selection. And nor is Greenpeace —they joined me when I made this statement, I think in 2002. They said it was fine, but no patents. This should be the genetic legacy of the planet, it doesn’t belong to anybody. The reason I’m vocal about this is because I spent 30 years of a lifetime on those questions. In Europe, the moratorium happened because I sat with the president of France, the prime minister, and presidents of several parties. And we maintained a moratorium here in the EU. Looking forward, I think the younger generation is going to share all the genetic information. They’re crowd-sourcing the genes now. Patents are going to be irrelevant to them. They’re going to go for marker-assisted selection. We’re moving to ecological agriculture. We have to have land reform in the Third World and we’d rather bring electricity there so people can be self-sufficient and connect across the third world. Turning to 100% organic agriculture is therefore achievable in your view? The only problem with going fully organic is the time you have to lay your land fallow in order to detox. And farmers don’t have that time. Farmers would love to do organic, they get a premium. And we see that consumers ? even working people — will pay more for organic products. Community-assisted agriculture is really spreading where urban dwellers are investing in a harvest ahead of time and become prosumers —the Internet allows them to do that, they put the money upfront and the harvest goes to them. But if a farmer has to lay their land fallow for seven or five years, whose going to subsidise this? We have all these agricultural subsidies in the EU, it should be going to subsidising the farmers so they can lay parts of their land in fallow and then make the turnover. Because in the end, it means less carbon footprint, less energy cost for the farmer, and better products for the consumers. It’s a better use of the subsidies. It also means smaller-scale agriculture. Except the way things are going right now is for the farms to grow bigger in scale in order to reduce costs. We’re seeing giant dairy farms sprouting, for instance. There is a point where you need to scale so that it’s commercially viable. But you don’t need the massive agro-farms, or the tiny plots. You have to find the right scale. There is so much that can be done in agriculture along the lines I’m talking about because of the evolving technology, consumer markets and climate change. I think we’re going to find out that agriculture is the number one cause for climate change, not buildings. Right now, the UN and the FAO say its number two. But if you build in all of the accompanying elements to agriculture, we may find out its number one. And here again, with the emergence of connected farming and the Internet of Things, consumers won’t need the middleman. Does this spell the end of the big retail chains? The Internet of Things allows for the democratisation of entrepreneurialism, because it’s low entry cost. It becomes easy to start off and create your own platforms. The biggest problem will be making sure that the successful platforms do not end up as monopolies and making sure they’re public utilities. I love Google as a search engine. But if it starts being a public good and everybody needs it….? Or Facebook, if it starts being a public good to communicate? What did we do with those in the 19th and the 20th century —the telephone systems, electricity grids, etc.? In my country, we kept them private. We regulated them as public utilities, we priced access, and it worked. So our governments took them over as public utilities. I have no doubt that it’s going to happen again. If somebody’s platforms become so successful, and become public goods on a global scale, it’s naïve to believe there won’t be a massive political struggle to transform them into public utilities. And they will succeed. There is no way the digital generation is going to sit there and accept this. How much people does organic farming feed now? This is a small part of what is consumed. It is a misconception to compare farm size in Europe and in the US. They have huge farms and they do not have the legislation we have for agriculture when it comes to environment. It is disappointing to see that Mr Rifkin talks about social justice and somehow justifies the growth of animal farms. Those unclear messages are passed to the MEPs and the citizens and bring as a result bigger farms. Last but not least I think that Mr Rifkin would do better to concentrate on the transport and energy sector that choke people. In the wake of the wv scandal it is not serious to make comparisons.